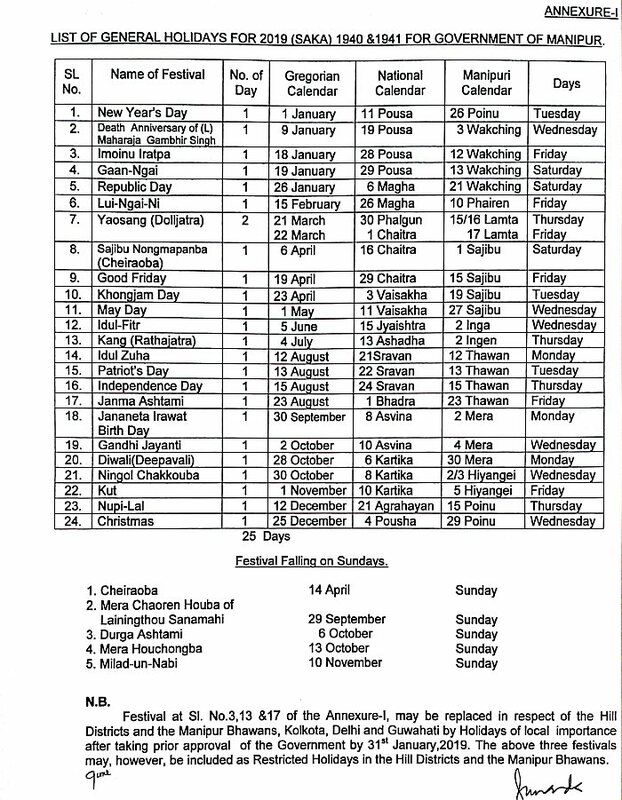 The Governor of Manipur is pleased to declare the days specified in the Annexure-I as GENERAL HOLIDAYS and the Annexure-III as RESTRICTED HOLIDAYS for the year, 2019 under the Government of Manipur. In exercise of the powers conferred by the explanation of section 25 of the Negotiable Instruments Act,1881 (Act XXVI of 1881), the Governor of Manipur is further pleased to declare the days specified in the ANNEXURE-II as PUBLIC HOLIDAYS for the Calendar year, 2019 in Manipur. Further, it is hereby ordered that the PUBLIC HOLIDAYS in connection with 'Yearly closing of Bank's Account' vide 'ANNEXURE —II' will be only in respect of all Commercial Banks in Manipur. As for Co-operative Banks in Manipur, the Holidays as notified vide Government letter No.2/21/88-R&L dated 09-12-1988 will remain unchanged.